Contractor calendars use is utilized in many industries. It is a 12 Month 18″ x 24″ 2 Color Wall Calendar, Tinned on on Top. Calendars include julian dates and working days, Faint lines in each date box for notes. Grid includes highlighted top and bottom which can done in standard/special colors. Imprint area is 17″ x 5.5″. Price includes One Color Imprint. Wall Calendars are a great way of getting messages across, visible to everyone at all times. 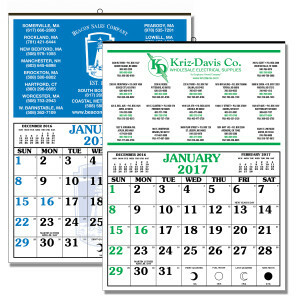 These Calendars are available in skirt style with backing and up to 4 color process. This is a 12 Month 19″ x 25″, 2 Color Wall Calendar, available Ruled or Unruled. Sundays and Holidays are Hi-lighted, Tinned or Spiral bound on Top. Imprint area is 18″ x 8″. Price includes One Color Imprint. Apron Wall Calendars are popular for their high quality look. These Calendars are economically priced to fit every budget. 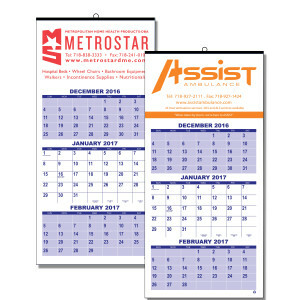 They are made available in a variety of colors and different style calendar pads. This is a 12 Month 18″ x 24″ 2 Color Wall Calendar, hole punched on top. Sundays and Holidays are Hi-lighted, Wire-bound on Top. Imprint area is 12″ x 18″ paperback, heavyweight coated. Price includes Full Color Imprint. Wall Calendars are a great way of getting messages across, visible to everyone at all times. 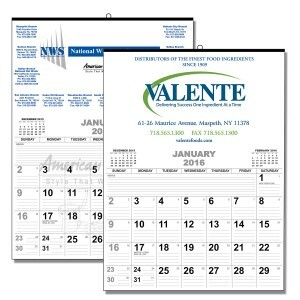 These Calendars are available in skirt style with backing and up to 4 color process. This is a 12 Month, 2 Color Wall Calendar, available Ruled or Unruled. Size is 9″ x 19″. Sundays and Holidays in blue, Tinned on Top. 3 Months at a glance. Imprint area is 8″ x 4-1/2″ on top. Price includes One Color Imprint. Wall Calendars are a great way of getting messages across, visible to everyone at all times. Size is 18″ x 24″, printed on heavyweight coated card stock, hole punched on top. Also available tinned and laminated, see additional options. Apron Wall Calendars are popular for their high quality look. These Calendars are economically priced to fit every budget. 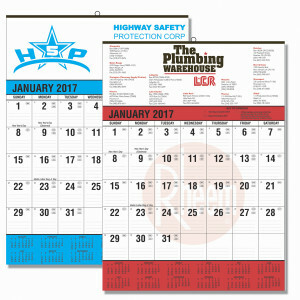 They are made available in a variety of colors and different style calendar pads. This is a 12 Month 17″ x 30″ 2 Color Wall Calendar, hole punched on top. Imprint area is 17″ x 8″ paperback, heavyweight coated. 5 Months at a Glance. Price includes Full Color Imprint. Apron Wall Calendars are popular for their high quality look. These Calendars are economically priced to fit every budget. 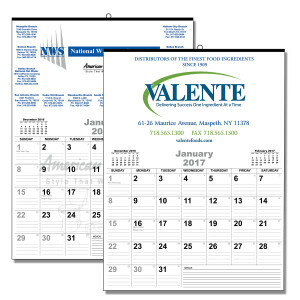 They are made available in a variety of colors and different style calendar pads. This is a 12 Month 12″ x 18″ 2 Color Wall Calendar, hole punched on top. Sundays and Holidays are Hi-lighted, Wire-bound on Top. Imprint area is 10″ x 5″ paperback, heavyweight coated. Price includes Full Color Imprint. 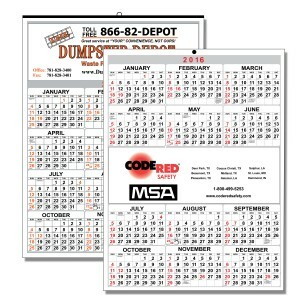 Wall Calendars are a great way of getting messages across, visible to everyone at all times. 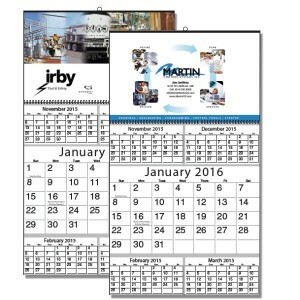 These Calendars are available in skirt style with backing and up to 4 color process. This is a 12 Month 2 Color Wall Calendar, size is 12″ x 18″. Sundays and Holidays are Hi-lighted, Tinned on Top. Imprint area is 10″ x 5″. Price includes One Color Imprint.